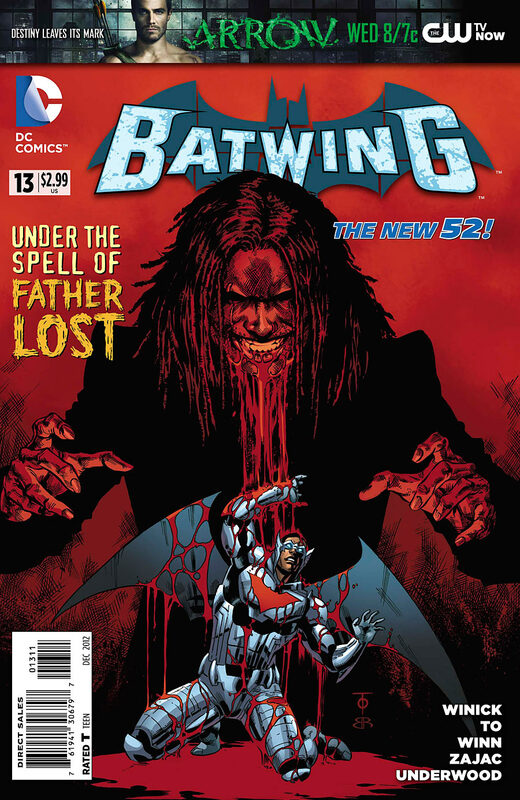 Batwing vs. Father Lost and his cult of death! He’s the new villain introduced in this issue – so who are the two new heroes you’ll meet? Find out here! In Africa “the finders” a cult dedicated to Father Lost commit ritual killing ad later Hara Kiri in his name. Dawn a local superhero tries to stop them but flees when the cops arrive. In jail Batwing tries to interrogate the only cultist left alive, he makes mind contact with them but is saved by officer Okura. At another cult rally Dawn attacks and frees some prisoners, on the verge of being overwhelmed Batwing arrives. Cover- Oooh nasty! So much blood oozing out of his mouth all over Batwing, there ought to be a law against this much blood on the stands. I love it! Art- Marcus To’s art has grown on me, either that or it’s gotten better over the course of drawing this book because to me this issue was pure art god. Black Hero–Dawn is a great addition with her energy swords. Very reminiscent of the X-men’s Psylocke. Batwing also shows some fancy new toys with his “image inducer”. I wish to see so much more from Batwing! 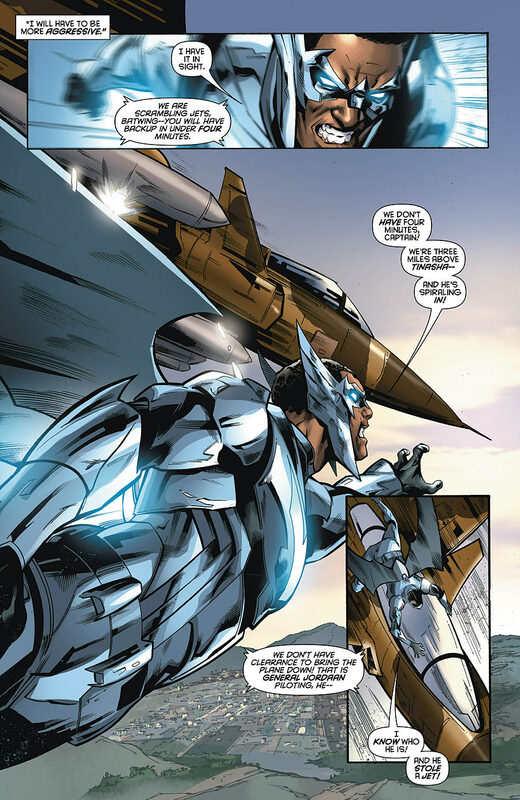 Note to DC more Batwing please, he’s so cool and underused in the new 52! Story-Very subdued in tone but very effective. It feels like forever since I saw this many black folk in a comic book. I literally felt like this could be happening down the street. Morality- This issue sparks a fresh debate about what ought to be done. Officer Okura is found accepting money from dirty cops. She explains to David that she’s doing it to be part of the team since without accepting she is isolated from the group like David, with no allies or friends. She does have a point but is it better to turn a blind eye to corruption to fit n and fight crime or should you rather be isolated and be less effective on the job because you’re a single finger and not part of a fist? Hmmm?! Judd Winick- He’s out and this issue has his name on the cover. Which issue will mark his last? I’m worried! With dwindling sales and the loss of the series writer how much longer can this title hold on until it’s cancelled like Mr. Terrific, Voodoo and Static Shock before it? Well … ok there is this “black-skin-batman” … I’m not fan but it’s my business … BUT WHY is black skin heroes have OBLIGATORY adventure in AFRICA ? At firs sight, I think it’s cool to have adventure in Africa BUT is white skin Bruce Wayne DID EVER go to Africa ???? The answer is NO … let’s have some reflexion WHY ? I hope this does not spell the end for Batwing.Such a shame. DC put out for black-led books at the same time, cancelled three of them, and told themselves ‘well, that’s it. We tried. Nobody should complain’. They have been hyping up Cyborg so much from the beginning of the new 52, yet he is the only one in the JL without a book. He appears in comics one time every month, and every time you see him, he is standing in the background while Batman, Superman, and the Flash do their thing. This is wack. We need more black comics. We actually need another Milestone-like company that would put out black heroes. I already have a bunch of stories to tell, but the comic market today is crazy. If Batwing gets cancelled, then DC has no black hero, and all that crap they were talking about diversity would turn out to be false hope for readers like us.